Puredental’s Southport dental crown treatment is just one of the many dentistry services we offer. If you have teeth that have been broken or have been weakened by decay or a very large filling, dental crowns are an ideal way to rebuild teeth. The crown fits right over the remaining part of the tooth, making it strong and giving it the shape and contour of a natural tooth. 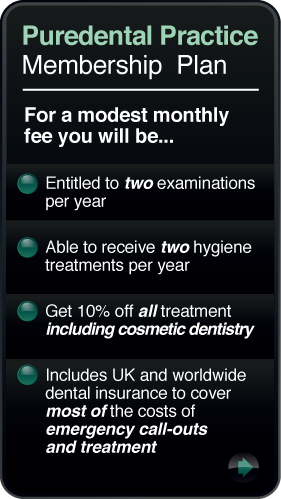 Here at Puredental we are happy to advise on the most suitable procedure for you. The crown (sometimes known as a ‘gap’) will be made to match your other teeth exactly. The shade of the neighbouring teeth will be recorded, to make sure that the colour looks natural and matches the surrounding teeth. A temporary crown, usually made in plastic, will be fitted at the end of the first appointment to last until the permanent one is ready. For more information pop into our Southport practice in 54 East Bank Street. We look forward to seeing you!